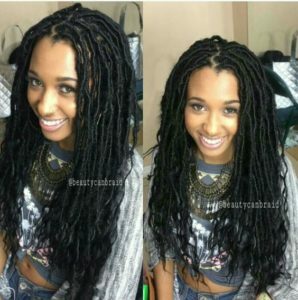 Faux locs have become an increasingly popular protective style in recent years. 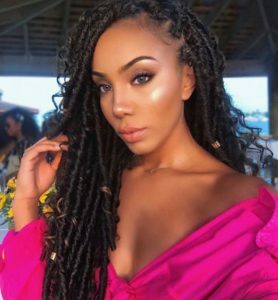 Goddess locs, which are faux locs that have curly ends, have become especially popular due to their extremely natural-looking appearance. They are often made with human hair, but synthetic hair such as Marley or Kanekalon hair can also be used. 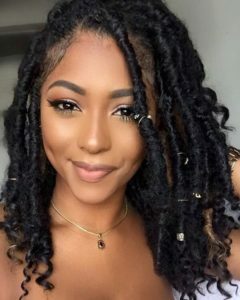 For those who are thinking about locking their natural hair, goddess locs can also be a great way to get an idea of what their hair will look like once that process is complete. 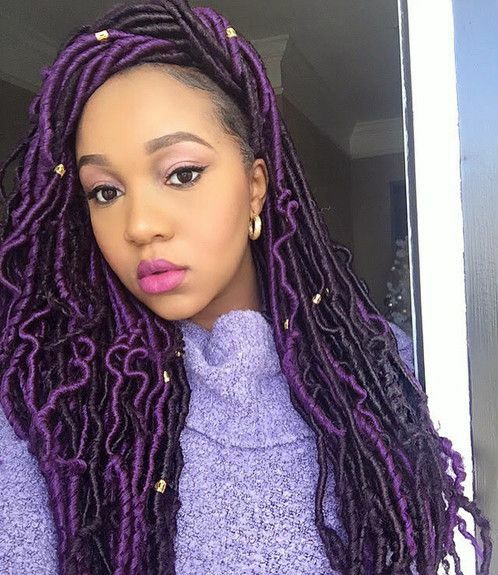 Let’s take a look at 55 ways you can style goddess locs. These gorgeous goddess locs stand out because of their natural-looking texture and deep red color. The side swept and curly ends make this looks extra chic! 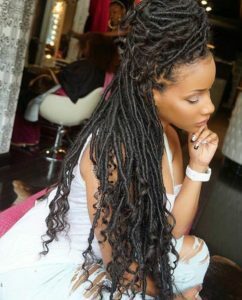 For this style, the goddess locs are piled into a loose high ponytail and hang over one shoulder. 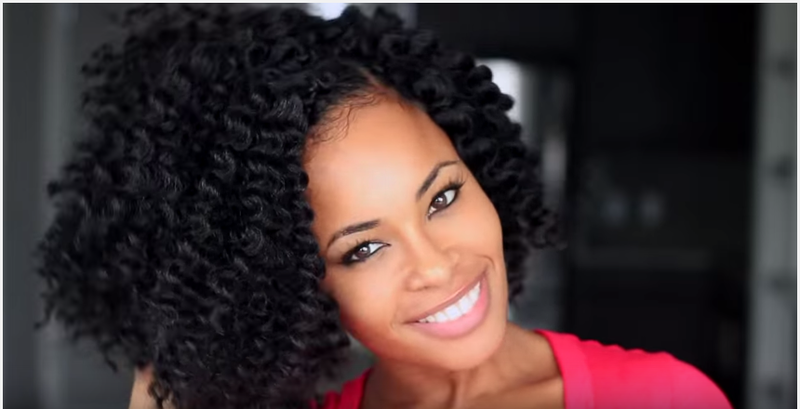 You can let a single loc hang loose on the other side of your head for a carefree look. These goddess locs are shorter in length but not in style. 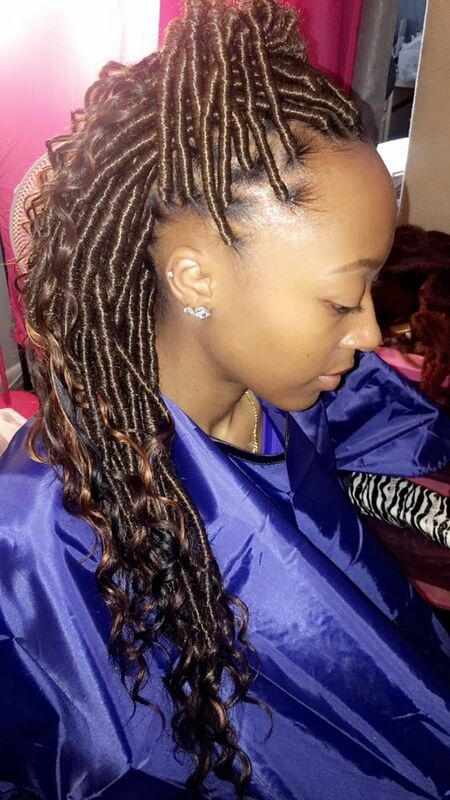 A touch of light brown hair creates pretty highlights and a little hair jewelry jazzes up the look even more. 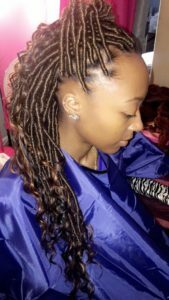 For this style, the goddess locs in the front are neatly pinned back while the rest hang loosely in the back. 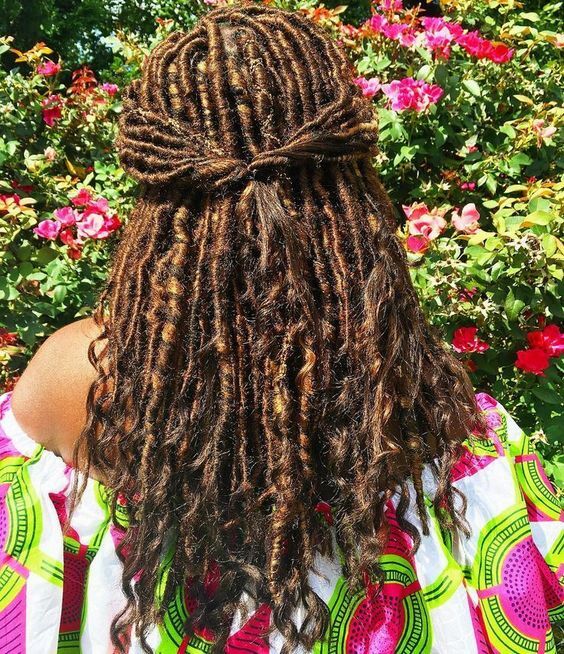 A simple but gorgeous way to show off your goddess locs. These goddess locs are styled into a simple side-swept look: a simple and classic style that never gets old. These golden-colored goddess locs are intertwined with loose strands of hair and styled into a half up half down double bun style for a casual, bohemian look. 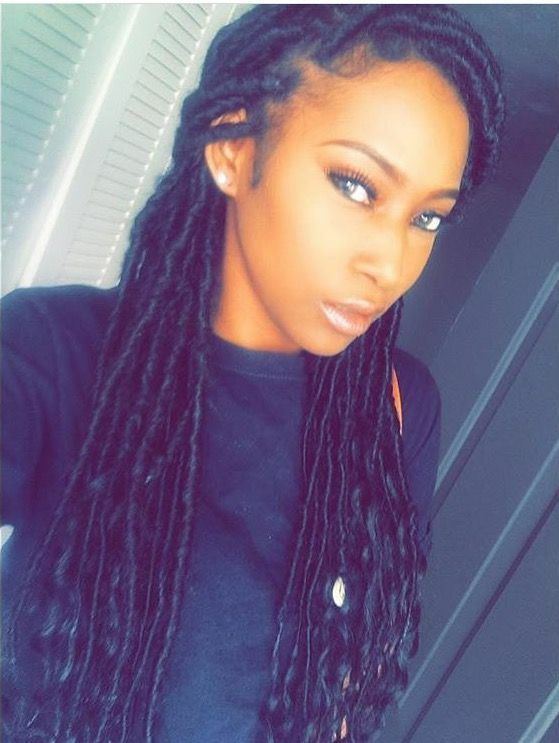 These gorgeous shoulder length goddess locs are perfect if you want a protective style that isn’t excessively long. 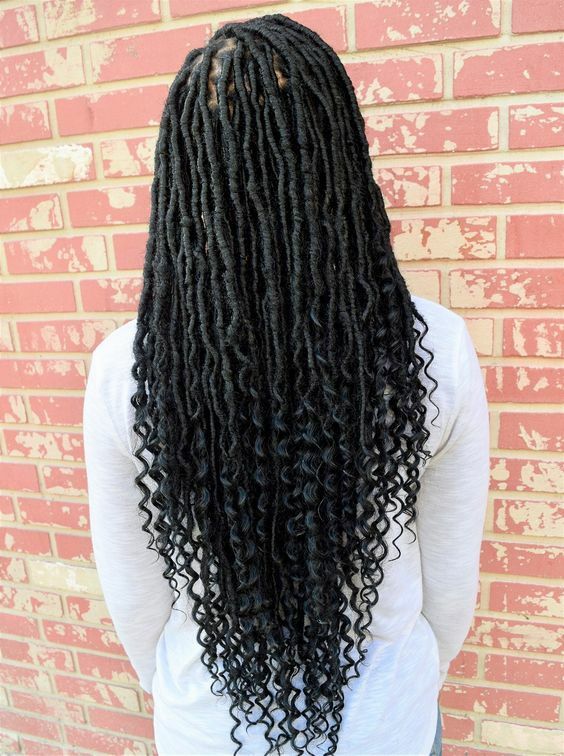 Since faux locs can be heavy, choosing a shorter length can reduce the weight of the locs. 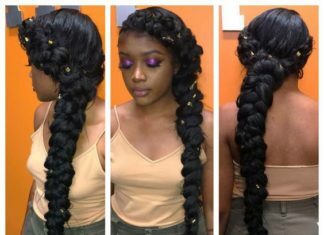 Hair accessories can be used to easily jazz up any style. 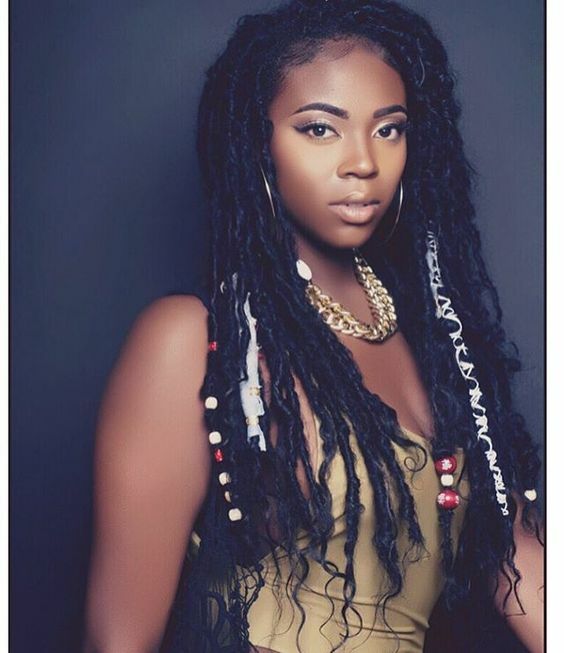 Colored cord, cowrie shells, and beads are used to accessorize these goddess locs. 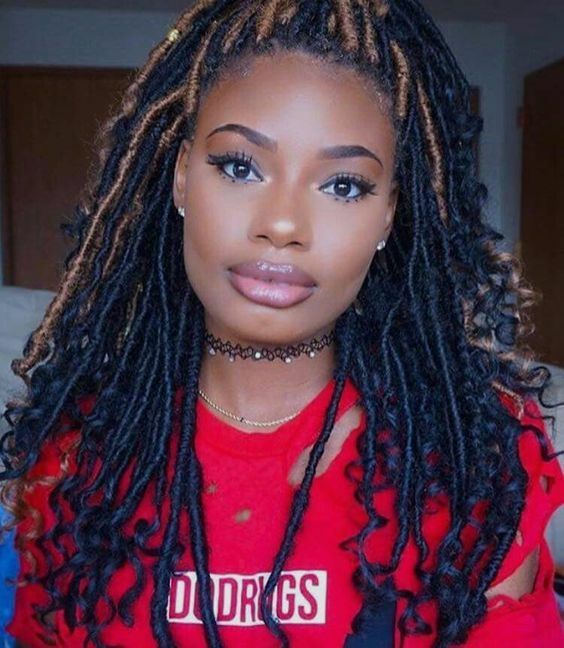 Multiple hair colors are used for these goddess locs, creating a unique highlighted look. 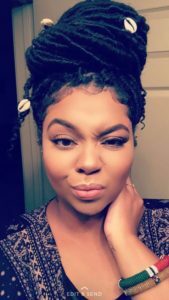 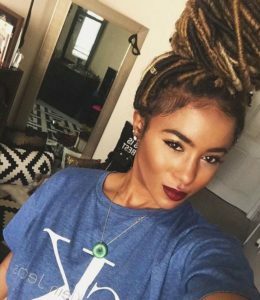 These goddess locs are styled into a faux hawk, showing off the shaved design on the side of the head: the perfect protective style if the sides of your head are already shaved. 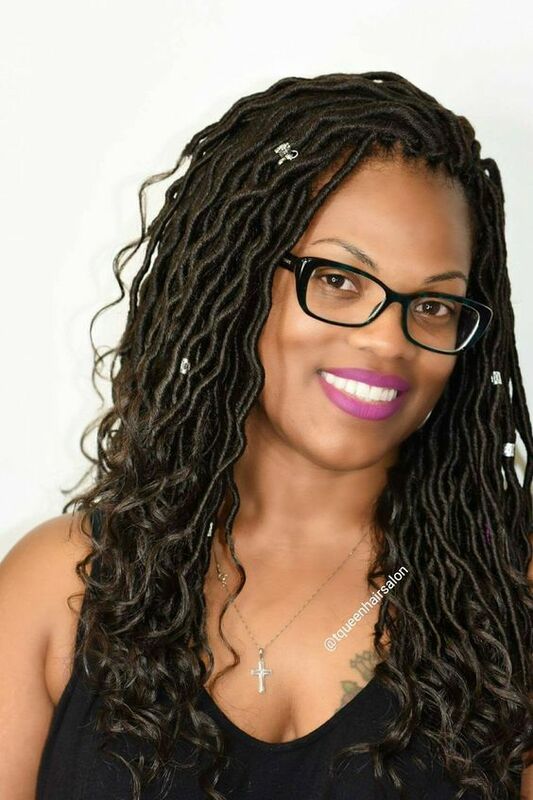 These ultra long goddess locs are perfect if you want a lot of length to play with. 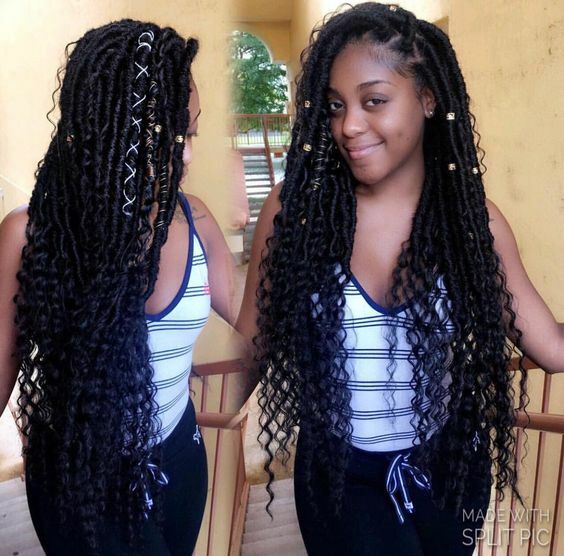 For this style, the curly ends make up almost half the length of each loc. These goddess locs are styled into a neat high bun: a classic style that can be casual or chic. 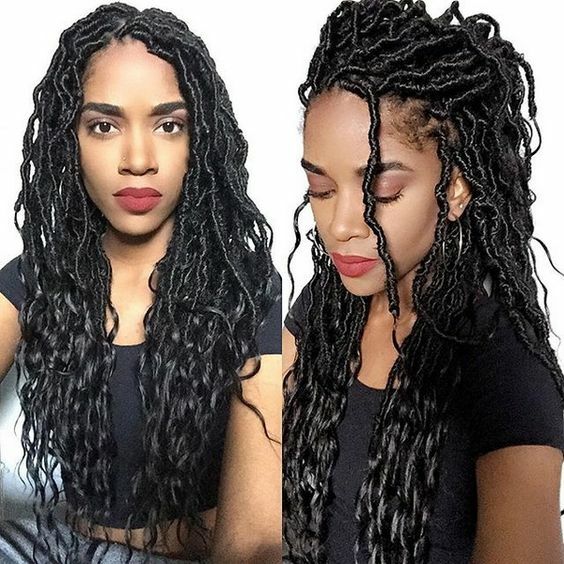 These super long beautiful goddess locs are styled into a carefree half up half down style featuring a loose messy bun at the top of the head. 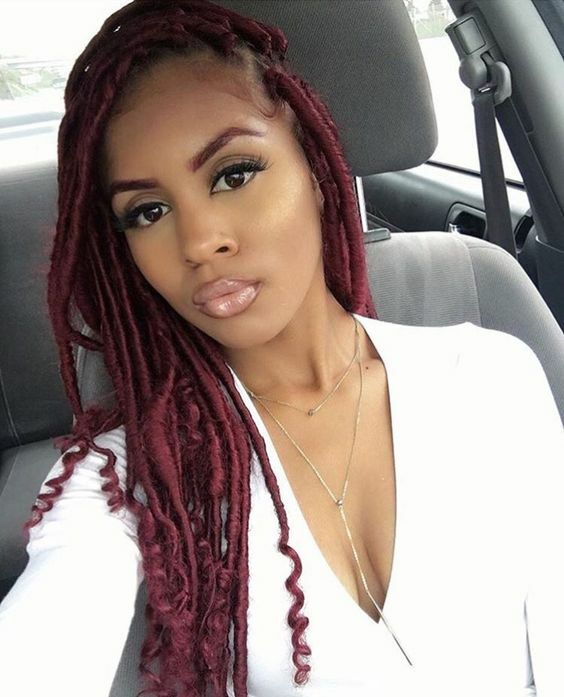 These light brown goddess locs are offset by a few blonde locs for a pretty color contrast. Light-colored cord is wrapped around a few locs to take this style to the next level. These goddess locs are styled into a half up half down style with double buns, creating a fun, youthful look. 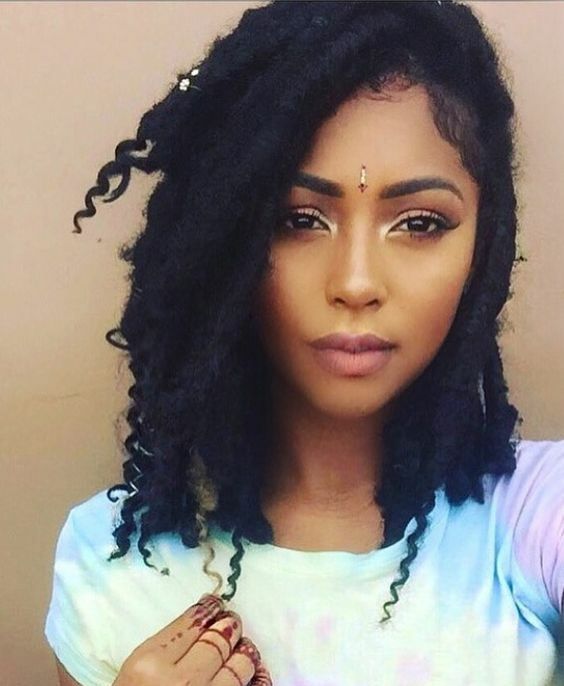 These goddess locs have an extremely natural-looking appearance. 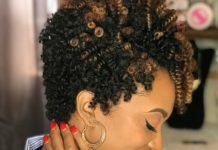 They fall right beneath the shoulders, a nice length that can be styled in many different ways. These gorgeous light brown goddess locs can be styled in a variety of ways, including the boho look pictured here: swept to one side and paired with a stylish hat. 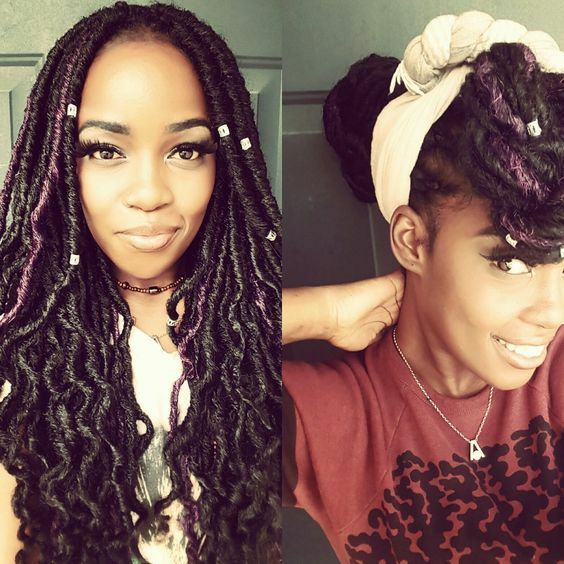 Head wraps are so versatile they can be used on all natural hair types, lengths, and protective styles. 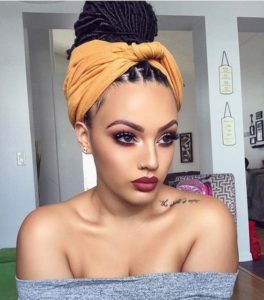 Goddess locs are no exception: they can be easily styled into a high bun and wrapped in a colorful scarf. 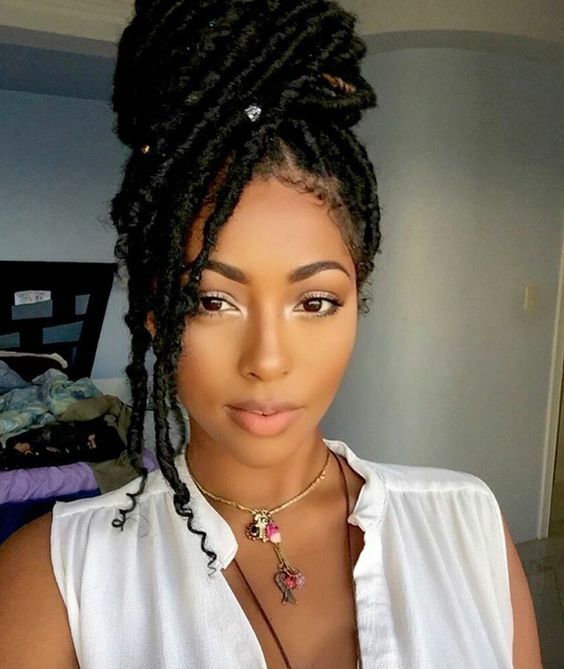 Strategically placed cowrie shells adorn these goddess locs, which are wrapped into a loose high bun. 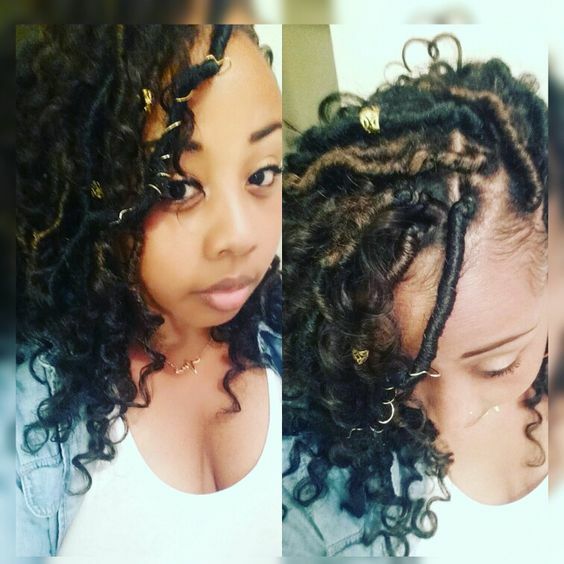 This is a cute and easy way to style your goddess locs. These gorgeous bob-length goddess locs are accessorized with gold beads and silver cords. 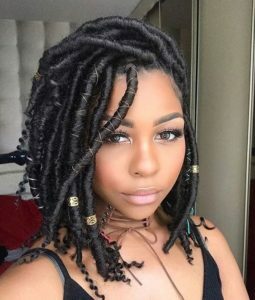 This look is perfect if you want short faux locs with medium thickness. These beautiful purple goddess locs almost look more like finger coils than faux locs at first glance. 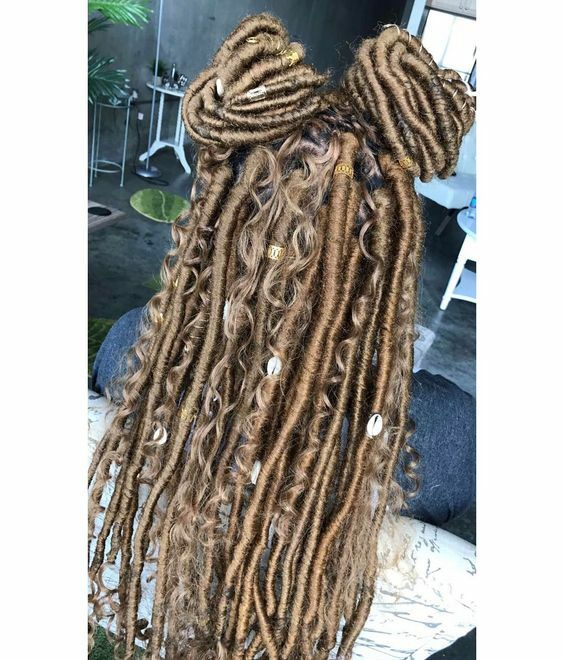 If you’re looking for a truly unique way to wear goddess locs, look no further. 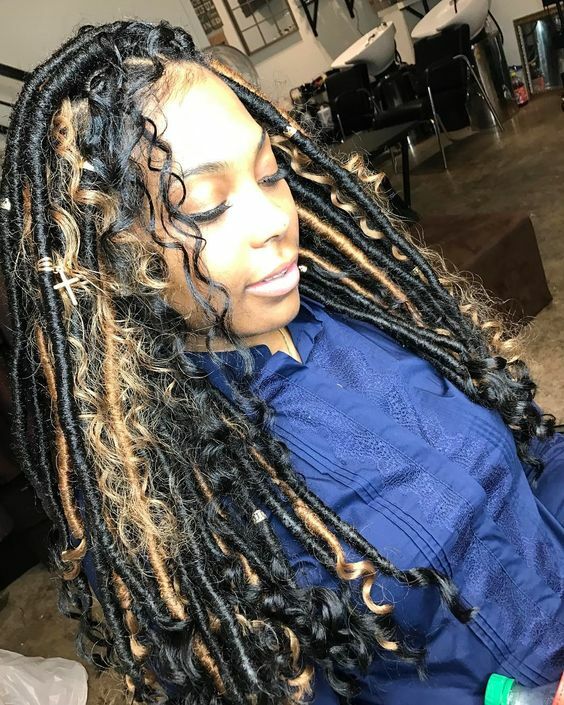 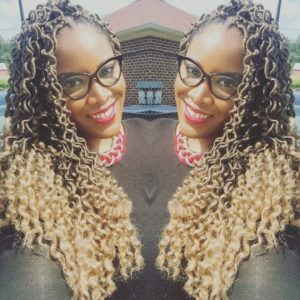 These golden-colored goddess locs are lighter on the ends, which are left loose and curly, creating a pretty ombre effect. Some people like their faux locs to be perfectly neat and uniform without a strand out of place, while others prefer a slightly messier look, which can actually make them look more natural: like these goddess locs, which are styled by pulling a few locs from the front and securing them together at the back of the head. For this style, the goddess locs are pulled up into a high bun. A few locs are left out, creating cute swoop bangs. Real locs are not immune to frizz, so while it’s easy to get rid of stray hairs on faux locs by running a lighter up and down each loc, letting them frizz a little actually makes them look more natural, like these fabulous shoulder-length goddess locs. 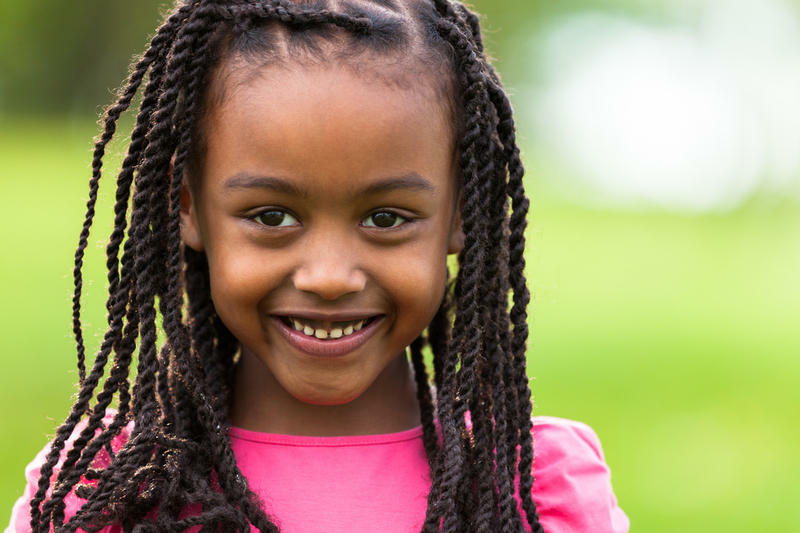 Even though shaving one side of your head may seem like a big commitment, there are still many protective styles you can wear, including goddess locs. 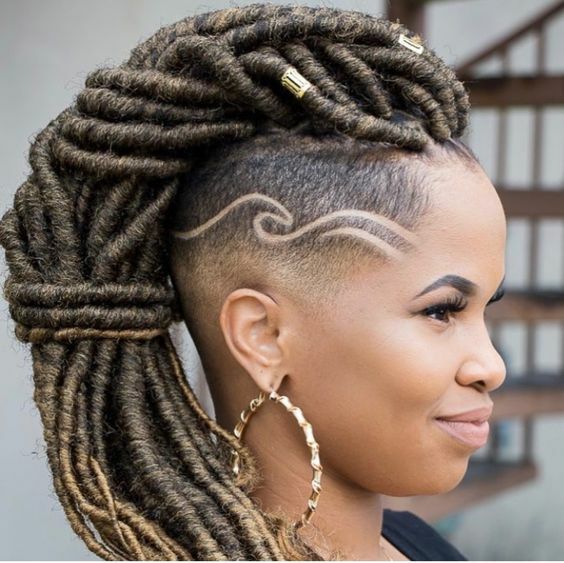 The contrast of the shaved look on one side and long goddess locs on the other side is strikingly beautiful. 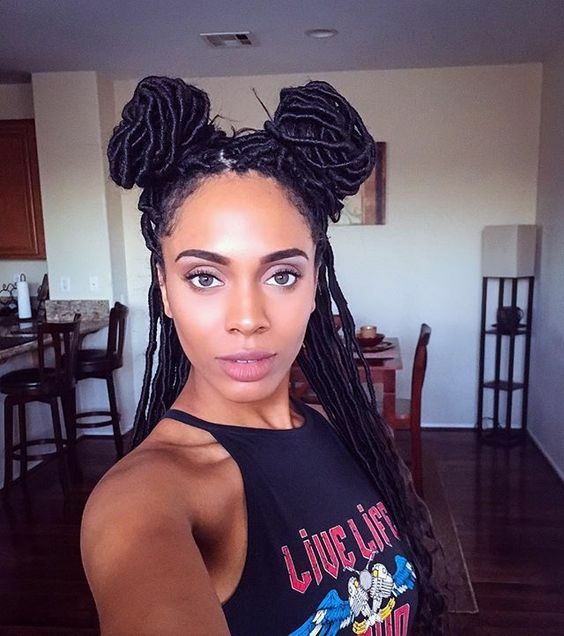 The high ponytail is a classic look that never goes out of style. 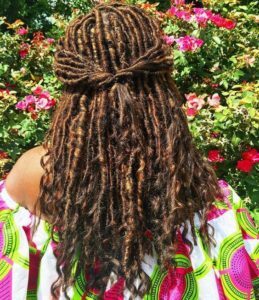 This is a cute, simple way to style your goddess locs. 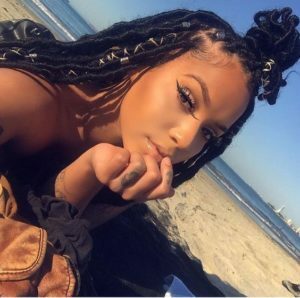 Just like the high pony, a side ponytail is another cute, fun way to style your goddess locs. It’s also a style that looks great on both long and medium lengths. 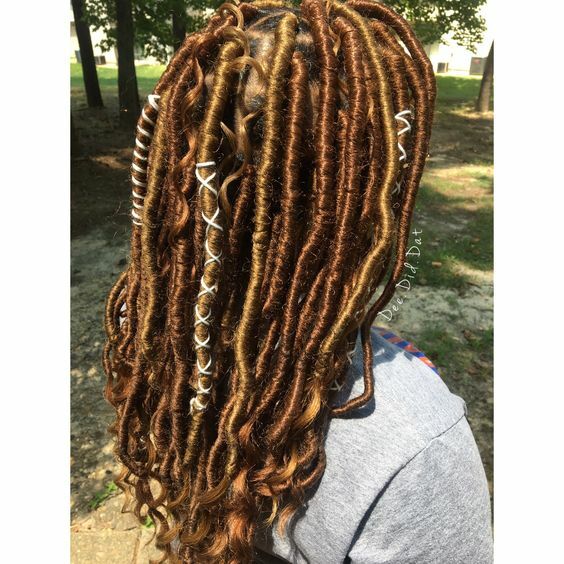 These goddess locs are uniform in color except for one single loc, which is lighter. 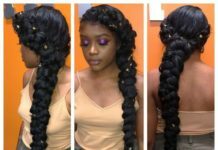 This is a cute, easy way to take a simple style up a notch. 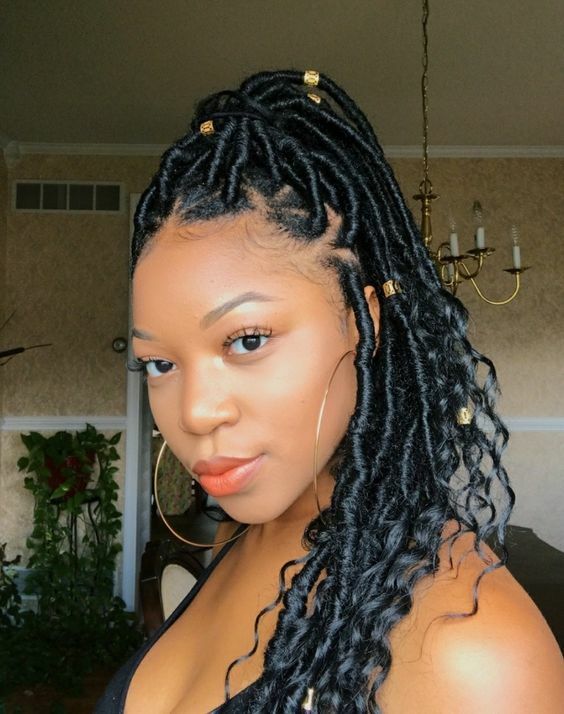 Sometimes all you need are the right accessories to create a new style, like the pretty silver beads that have been added to these gorgeous, simple goddess locs pictured here. These pretty brown goddess locs can either be matched to your natural hair color or used as a way to experiment with a new hair color without having to dye your hair. 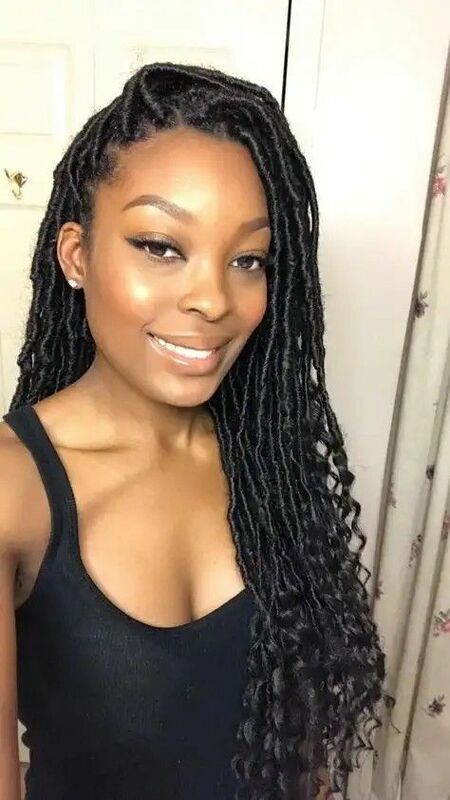 These goddess locs are parted on one side and the locs in the front are then pulled and pinned to the back for an effortless half pulled back look. 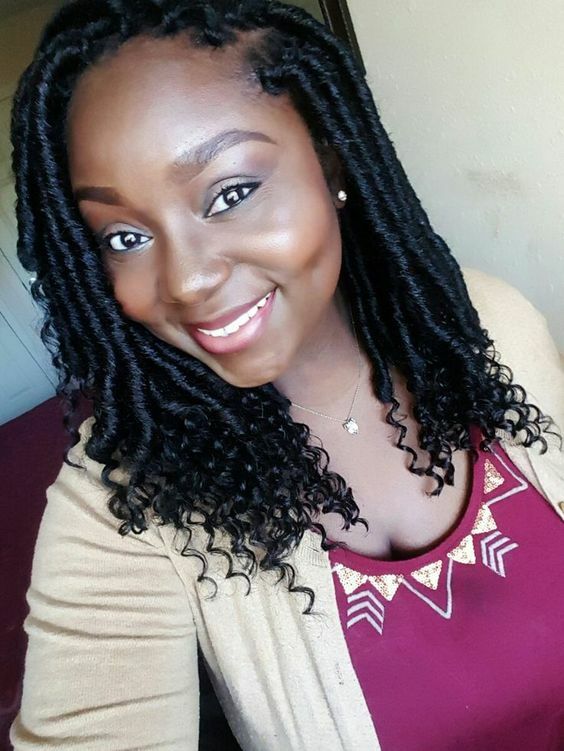 Beads aren’t the only accessories you can use to dress up protective styles. 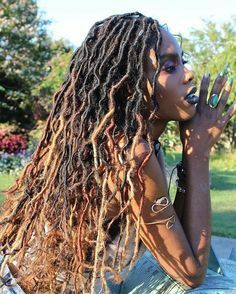 Hair rings are another pretty way to accessorize goddess locs. Another variation of the ever-popular half up half down hairstyle involves pulling the hair in the front into a high ponytail (instead of a bun) and letting the rest hang loose. 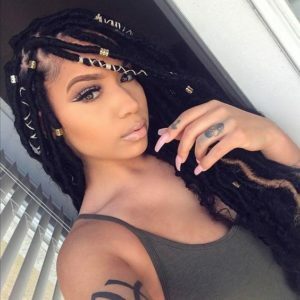 Add a few gold beads for even more flair. There are a lot of different ways to style goddess locs this long, but sometimes you just want to go for a simple look, as pictured here. 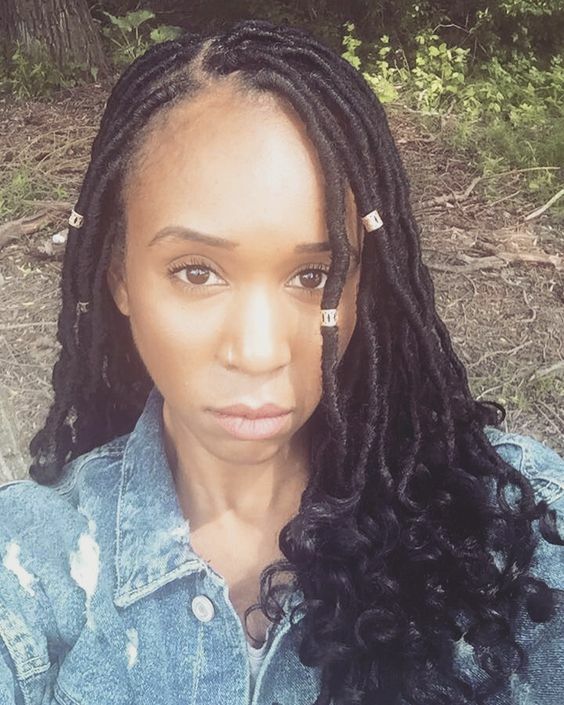 A simple side part is all you need to rock these extra long locs in all of their glory. 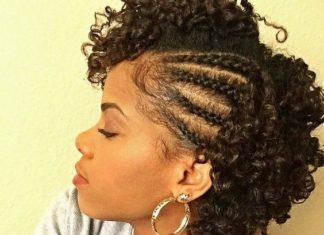 If you don’t like having your hair in your face, this style is a simple solution to that problem. Just twist and arrange the locs away from your face and use bobby pins to secure them if necessary. A combination of gold beads and gold-colored cord is used to accessorize these goddess locs. Use golden-colored hair for a single loc to complete the look. 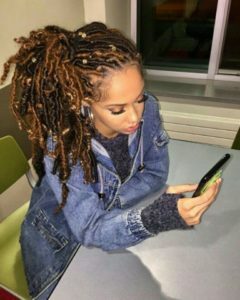 This style doesn’t quite qualify as a half up half down style since only a small section of hair in the front is pulled up, but it is still just as stylish. 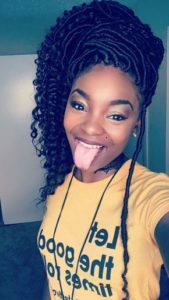 Take a section about the size of bangs right at the front and pull it up into a messy top knot for a fun, cute style that’s perfect as an everyday look. When it comes to accessorizing goddess locs, you don’t have to stick to just one type of accessory. 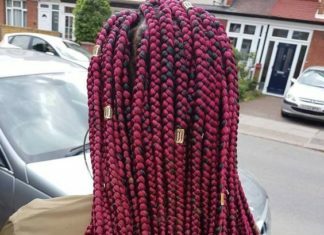 You can easily mix and match beads, cowrie shells and colored cord, as pictured here, without creating a look that is too busy. 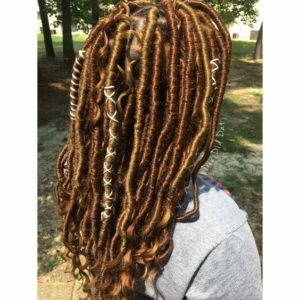 The foundation for any style, these long, simple goddess locs are gorgeous as is: no accessories or fancy styles needed. 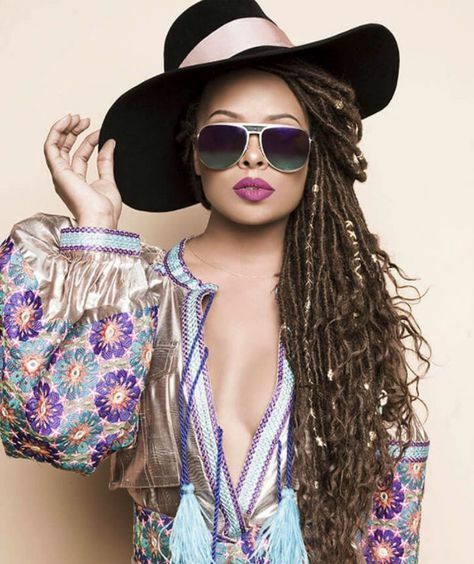 If you’re looking for a fun, carefree look for your next protective style, consider these multi-colored goddess locs. 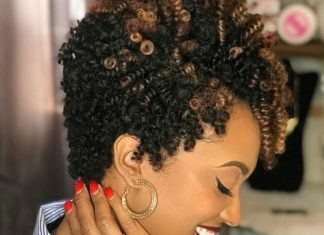 The combination of different colors and textures give this style a unique look. 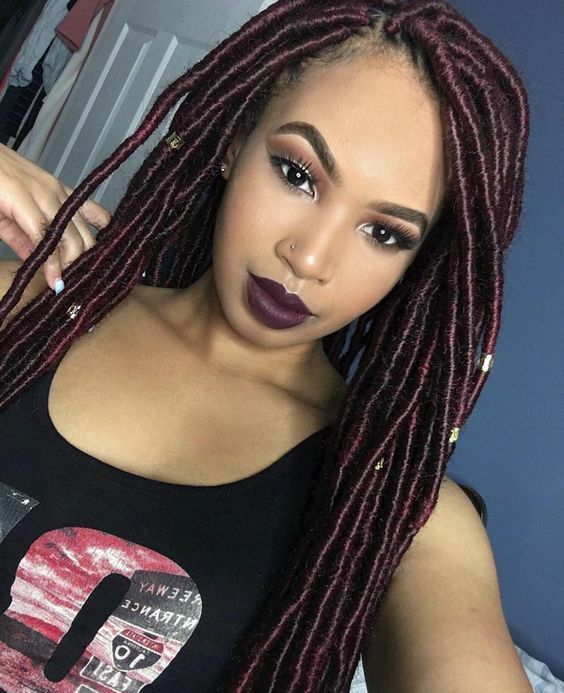 If you’re in the mood to experiment with color but you’re looking for a more subtle shade, these burgundy goddess locs are a great choice. This gorgeous shade looks great on just about any skin tone and the color is vibrant yet understated. 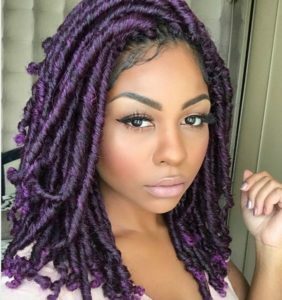 Purple is a popular color for goddess locs, but if you want to switch it up, consider making half of your locs black and the other half purple. The contrast will make the purple color pop even more. These salt and pepper goddess locs are a great choice for those who like the look of grey hair but don’t want to commit to a head full of grey. 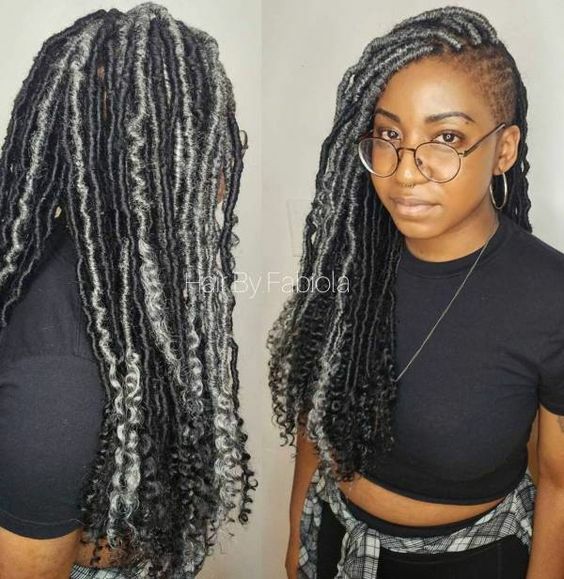 While grey has been a trendy hair color for the past several years, this style still manages to look fresh and new. 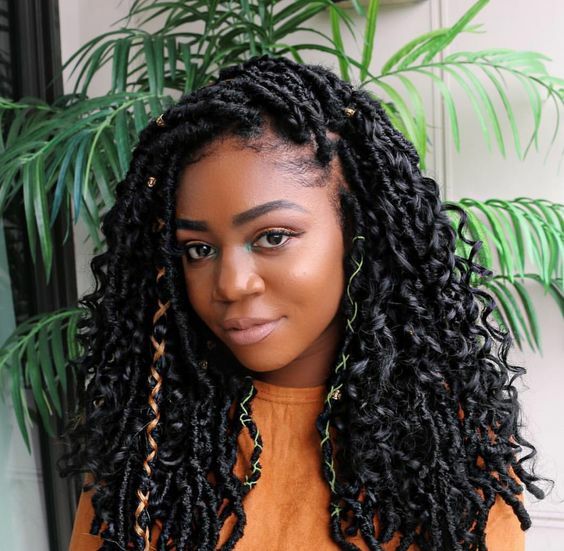 A simple way to spice up a simple style is to add a little color. A touch of brown makes these gorgeous black goddess locs pop. 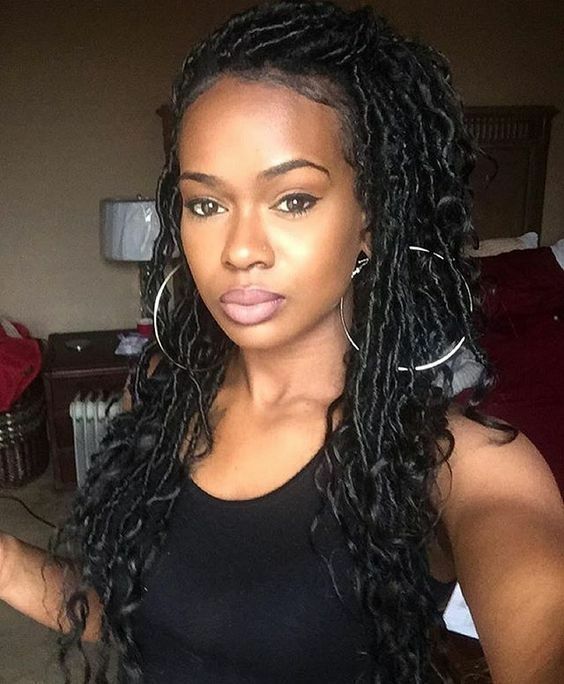 You really can’t go wrong with a simple middle part. This an easy way to style your goddess locs and it works great as an everyday look. These gorgeous waist-length goddess locs are a great option if you want a protective style that gives you a lot of length to play with. You can wear them up, down, or somewhere in between, depending on your mood. You can style these multi-colored brown goddess locs in a variety of ways, but a classic, chic high bun is a great way to effortlessly show off their color and texture. 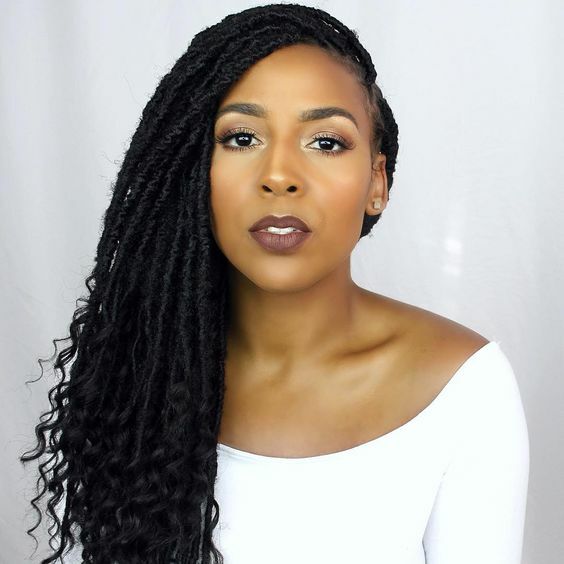 Adding colored cord is a great way to embellish protective styles like box braids and goddess locs. These goddess locs are absolutely beautiful on their own, but the cord takes the look up a notch. While colorful goddess locs are fun and stylish, if you want a look that’s simple, these black goddess locs are a great choice. You can never go wrong with a classic look. If you don’t want to commit colored goddess locs, try making just a few locs in the front a different color. 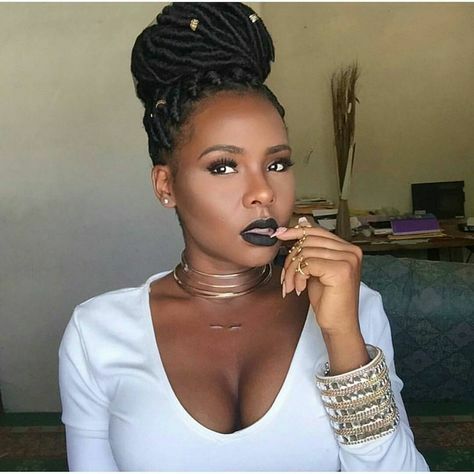 This look creates a great color contrast, especially when you style the locs in a cute updo. 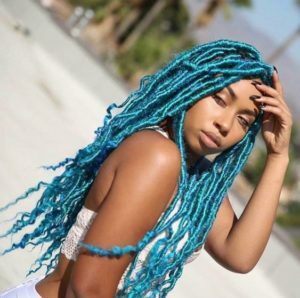 These gorgeous turquoise goddess locs give new meaning to the term “mermaid hair.” If you want a bold, vibrant color for your goddess locs, this is an excellent choice. If you want your goddess locs to be sleek and shiny, check out different brands and colors of kanekalon hair. 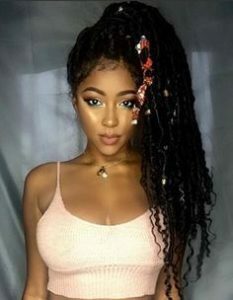 This type of hair tends to have more sheen than a lot of other types of hair. 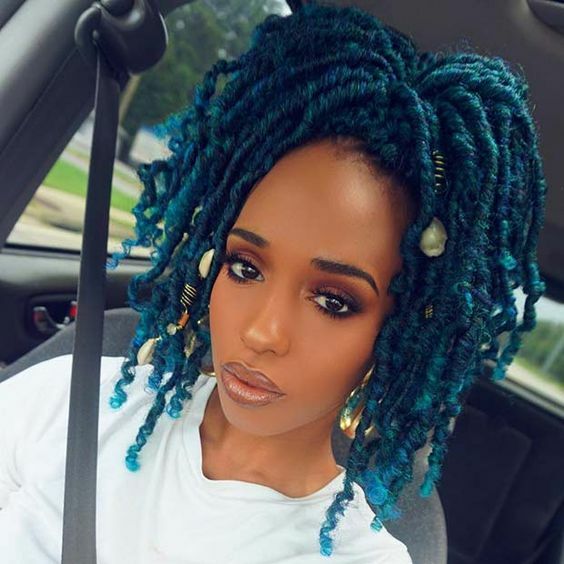 Teal goddess locs are something you definitely don’t see every day, but the look is absolutely stunning. 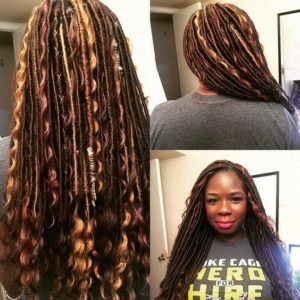 If you’re looking for a color that really makes you stand out in a crowd, these goddess locs will get the job done. 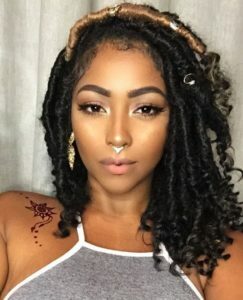 If you have a hard time deciding on one color for your goddess locs, these multi-colored goddess locs are a great option. 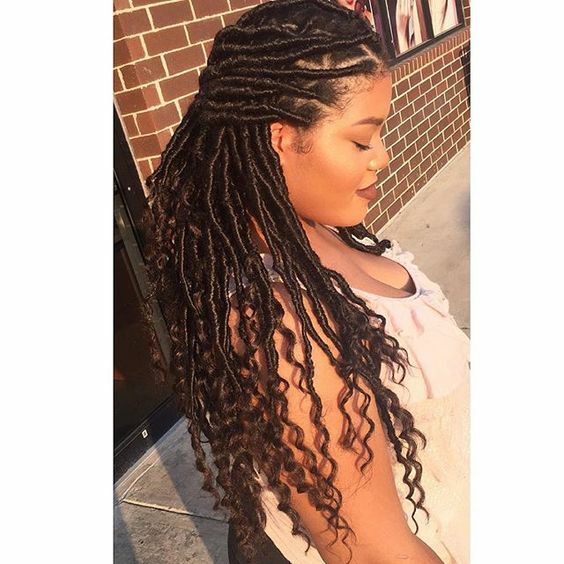 They have a gorgeous sun-kissed look that’s perfect for the summer months. Pull your goddess locs to one side, it will revamp your overall look without any effort or manipulation.